This week I have been struggling with a skin infection that is presumed to be MRSA. I foolishly waited too long to seek treatment, hoping it would heal on its own, since I know that antibiotics make me sick. By the time I saw the doctor, it was getting systemic and I was feeling generally bad and also a little loopy. My original plan for Thursday’s dinner was bratwurst, but that didn’t sound at all appealing and would require a trip to Fresh Market since Costco apparently doesn’t sell fresh brats anymore. Hey, I’m still a Wisconsin girl at heart, so I am picky about my brats! In my semi-septic state I decided to pull some leftover chicken and bone broth out of the freezer to make some sort of nourishing, immune-building chicken soup. 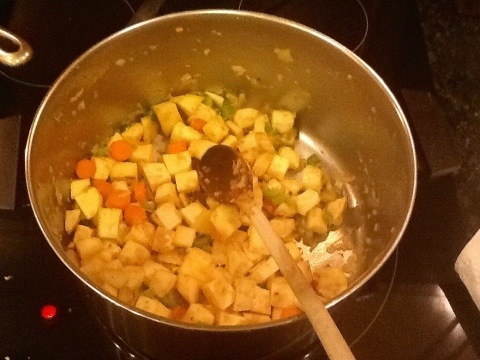 I didn’t take many pictures since I was half out-of-it when I made the soup. 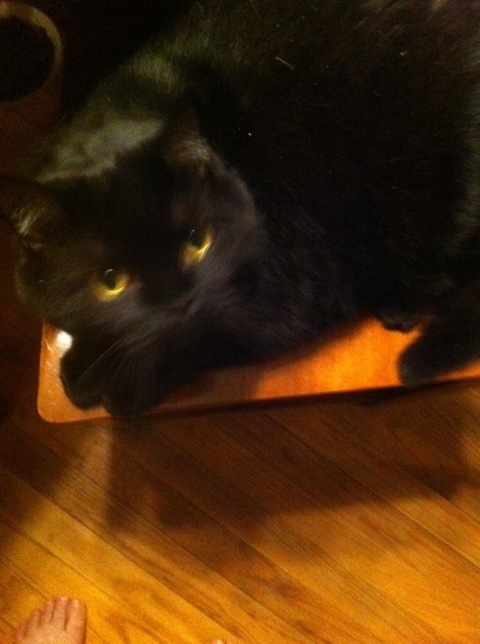 So this is my friend Coll’s cat Sammy. Isn’t he big and cute? 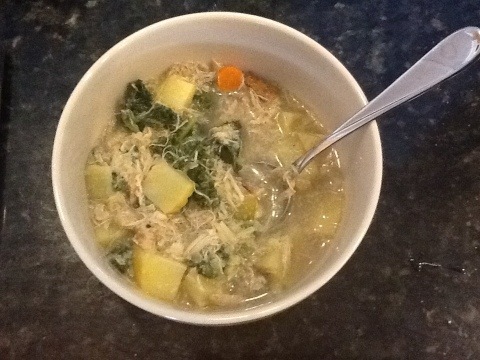 Anyway, I had found a delicious-sounding recipe for Chicken Soup with Kale, Garlic and Sweet Potatoes and strangely enough I had all the ingredients! Even stranger, this recipe contains bacon and is cooked in bacon fat, yet the author neglected to include “bacon” in the title. I mean, nothing against kale or garlic, but I get more excited over bacon hands down than either of those ingredients. Now with sweet potato it would be a tie. I didn’t get all fancy and serve this soup over fresh tomatoes, but I did cook whole wheat alphabet pasta separately and served the girls’ soup over that. So I’ll post a simplified version of the recipe since I already had cooked chicken and homemade chicken stock to use. 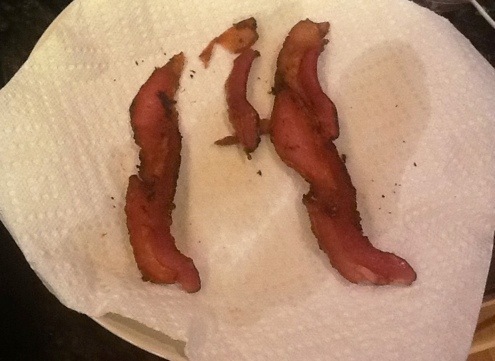 If you don’t have leftover bacon then cook the bacon. 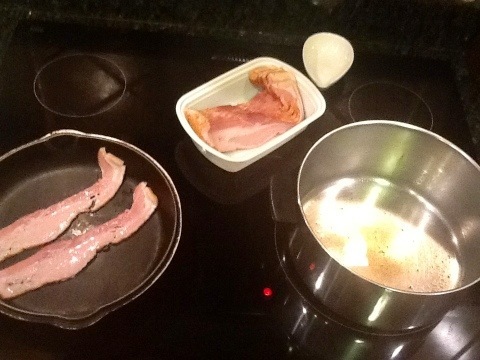 If you are short on time as I was, you can cook the bacon in one pan and start the soup in a pot. I heated up the bacon grease in the soup pot over low heat and sautéed the onions until soft and golden. This avoids the dreaded crunchy onions which ruin recipes for Tom. I added the rest of the vegetables in the order listed as I got them chopped. I used a white sweet potato this time. I had to add more bacon grease about halfway through..
It’s always challenging to crumble up the bacon without eating it. If I had been more lucid, I would have fried up an extra piece for snacking. 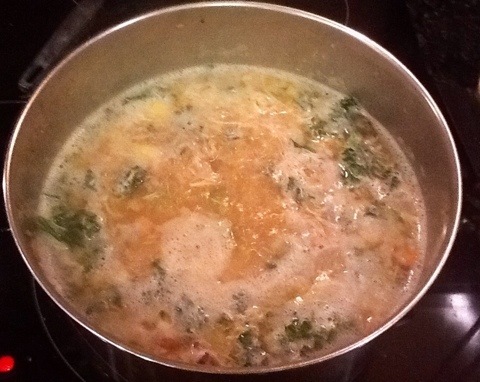 Then i added the seasoning and the stock. It didn’t look like enough stock, so i just added some water. If you want a rich, creamy stock you could add some coconut milk. At some point in here I added the kale and the nutmeg. Then I added the shredded chicken. I decided that the amount of leftover chicken in my freezer was the correct amount, I suggest that you use the same sort of decision making process. It took longer than the original recipe said for the vegetables to cook through. I didn’t time it so I’m not sure how long. Including prep time this soup took about an hour and fifteen minutes to cook, not too bad for a weeknight meal when we have to eat late anyway. Success! Everyone agreed that the best part of the soup was the broth. Most of that was from using good quality homemade broth, but the bacon flavor added a certain depth to it. I was thankful to have leftovers available today to have for lunch after I discovered that doubling up on antibiotics while fasting for a procedure was a misguided combination. I have already performed more than adequate penance for eating meat today. Jen, this sounds really good. I’m a recent (at Cathy’s encouragement) kale convert and I can use additional recipes to put it in. The good thing is kale lasts so long that it doesn’t go to waste with only one person eating at a big bag. Have you tried kale chips yet? We really like them. Jewel and I think they are better than potato chips.